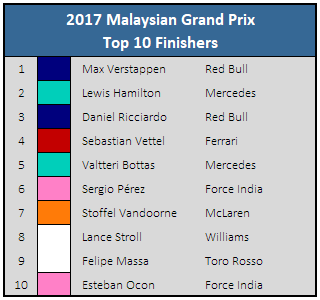 Max Verstappen took his second career victory at the 2017 Malaysian Grand Prix, a win less hard-fought than his first but surely no less appreciated by the Dutch driver and all his fans the day after his 20th birthday. Championship leader Lewis Hamilton finished in a comfortable second place behind him, followed by Daniel Ricciardo and Sebastian Vettel. Kimi Räikkönen, you’ll note in the table to the right, was nowhere to be seen despite having qualified second on the grid. He was to play an instrumental role in minimizing the amount of points Hamilton could gain on Vettel for the championship title, as reliability issues had forced Vettel to start from the very back of the pack. As it happened, it was the turn of Räikkönen’s car to experience problems and the Finn was unable to even start the Grand Prix. It was a griping race nonetheless, especially with Verstappen immediately putting on the heat and taking the lead on the fourth lap, though you got the sense Hamilton didn’t fight quite as hard as he normally would have. 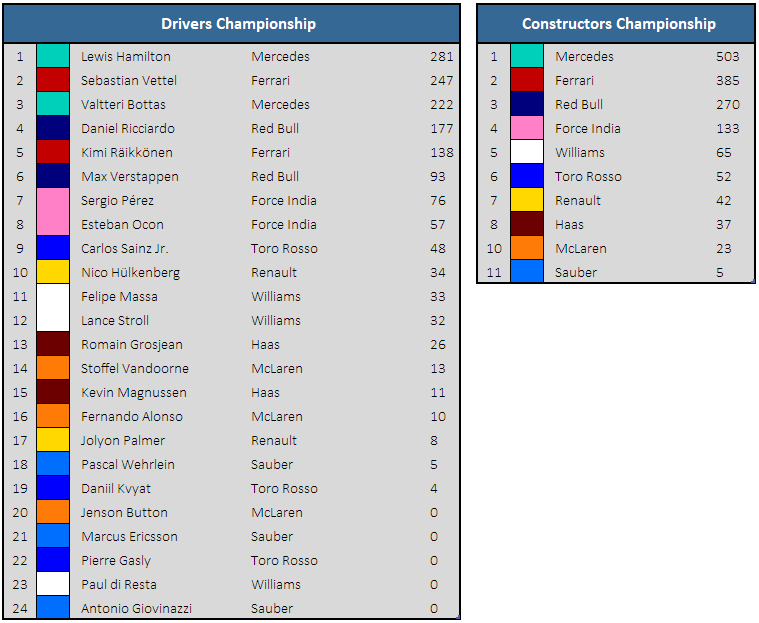 With him already leading the championship by a large margin and Vettel starting last, Hamilton would have had no reason to take unnecessary risks and compromise that lead. Then Ricciardo, in the other Red Bull car, also managed to pass Valtteri Bottas in the other Mercedes car, which was a much harder-fought battle. Meanwhile, Vettel gradually sliced his way through the field. He was 19th when the race begun and 12th by the end of the first lap. 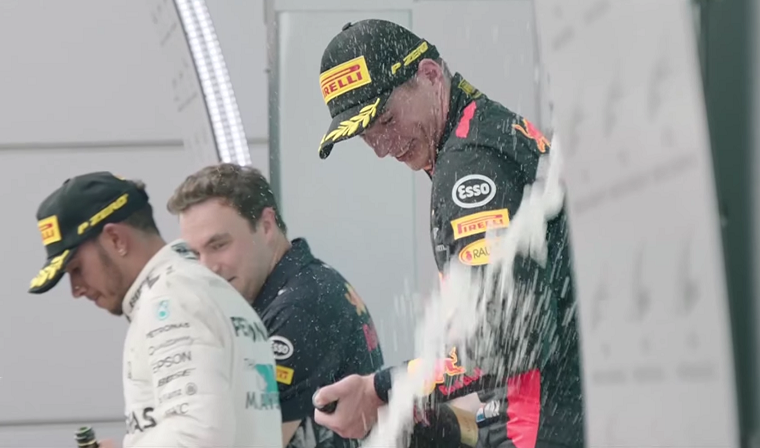 He pit while in 5th place and successfully undercut Bottas to make up one more. The strategy had a downside, though: he would be on the less durable tire for much longer than he’d have liked. After the pit stop, Vettel hunted Ricciardo down. On lap 30, he was a solid 15 seconds behind his former teammate. By lap 46, he had caught him and still had another 10 laps to make a pass. He got achingly close three laps later, after having lost time to Fernando Alonso—who, in his usual manner, pettily held up Vettel as much as possible when shown the blue flags—but couldn’t make it stick. Even the overtake had been successful, he may have lost the place soon after, as Vettel was forced to spend the last handful of laps in extreme fuel-saving mode to ensure he made it to the finish line. Fourth place after starting last is nothing to be sorry about, and Vettel certainly made the best of the terrible hand he was dealt on Saturday—but just as soon as the race was over, at the very moment it was announced he had been voted “Driver of the Day,” yet another incident took place that may cost the four-time champion: on their cool-down lap, Vettel began driving around Lance Stroll in a corner when the rookie ran into him and destroyed the rear end of the Ferrari. Stroll had been driving straight in the corner, presumably to pick up marbles on the edge of the track to increase the weight of his car, and seemed not to be paying attention to his surroundings. It is possible Vettel’s car will need a gearbox change because of the damage, which would result in a five-place grid penalty at the upcoming Japanese Grand Prix. It seems, then, that Vettel will have experienced an awful string of bad luck at the three consecutive races where he has historically been strongest.